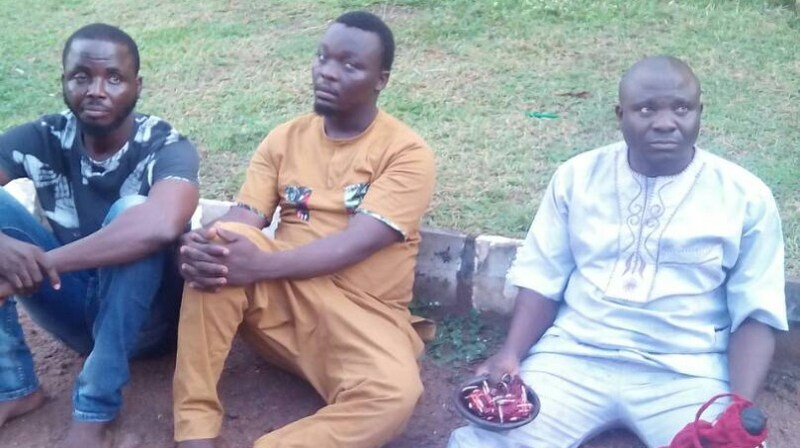 Three self acclaimed Islamic clerics have been arrested by Ogun State Police Command over alleged rituals and murder. The Commissioner of Police, Ahmed Ilyasu, who paraded the suspects on Sunday at the Federal Special Anti-Robbery Squad, SARS, headquarters in Abeokuta said they were arrested on October 5. He gave the identities of the trio as Adebayo Mudashiru (36), Raheed Abass (33) and Rasaq Adenekan (42), adding that they were caught with fresh and dried human parts, human skull, reptiles and assorted charms. Mr. Ilyasu disclosed that on interrogation the suspects were discovered to be serial killers, with their operational office located at number 6 Baase compound, Totoro, Abeokuta. The three suspects while speaking with PREMIUM TIMES claimed to be ‘alfas’ – Islamic scholars. They said they engaged in the rituals to help solve their clients’ problems. The police also paraded two suspects who are said to specialise in stealing Automated Machine, ATM, cards. They were arrested after their operation in Mowe town of the state. The suspects, Michael Uko and Tope Adegoke, were arrested after robbing a victim, Aina Olufemi, the police said. “They successfully robbed their victim, inflicted cutlass injuries on him, tied him down and went away with his ATM card after forcing him to give them his pin number,” the commissioner said. He added the bandits later took the ATM card to the bank and withdrew N100,000 cash from the victim’s account. “The Federal Special Anti-Robbery Squad, FSARS, operatives swung into action and through diligent investigation, two members of the syndicate were arrested on the 5th of October, 2017,” Mr. Ilyasu said.